Capture the Magic of Santa! Your Kids Will Be Thrilled! Thrill your kids this Christmas and Catch Santa in YOUR house! Because seeing is believing and the magic of Christmas is such a special time in a child's life, you can now have proof that Santa came to visit! 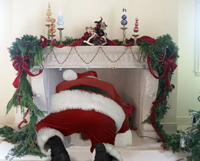 Capture The Magic is a simple website where you simply upload an image of a room in your home, choose a Santa (there are hundreds of different poses!) and simply place the Santa into your image....all the tools you need are online to give you image the realistic touch including brightness and resizing! Once you are happy with the look of your image you can then pay for it and checkout which will then allow you to download your new image! You get a print quality file that will truly be a cherished keepsake! The first photo is only $9.95! A small price to pay for that look of awe and wonder on child's face on Christmas morning! So go ahead and get your proof of Santa's Visit today!